Stay TWO nights in one of our most romantic rooms with a queen /king bed, fireplace, soaking clawfoot tub or double Jacuzzi tub. We will be happy to arrange the ceremony by either the local justice of peace or minister. After the ceremony, there will be a display of heavy hors d’oeuvres for your guests including signature dishes like our Cooper’s Landing Hot Crab Dip, Sausage Stuffed Mushrooms, Baked Brie topped with a Kahlua Pecan Compote. There will also be a chilled bottle of champagne for your wedding toast. Our pastry chef will customize a white wedding cake to meet your sweet-tooth desires. There will be long stem roses or wildflowers for the bride which can either be arranged into a bridal bouquet or arranged in your room. On one of the nights you stay, join us downstairs in one of our candlelight dining rooms or have a fireside dinner in your room from our award-winning restaurant Traveler’s Tavern. After dinner, dip into “Cooper’s Springs,” our enclosed hot tub in the restored smokehouse which boasts a hanging chandelier and skylight to view the night stars. Once you return to your room there will be silk rose petals on the bed and a tray of chocolate covered strawberries. Enjoy all the romance for $1095 for a deluxe room, $1195 for a double Jacuzzi suite, $1395 for a private two-bedroom cottage ($100 of the total package is payable directly to the minister for your ceremony fees) Package suitable for 10-12 wedding guests. Your ceremony will be held in our Secret Garden Wedding Gazebo. The white wedding gazebo is surrounded by 16 foot Wayland Cypress trees to make the bride and her guests feel like they have escaped to a secret garden. The gazebo makes the perfect location for a day or night wedding. If you’d like to hold your wedding under the stars, the gazebo is lit by a hanging chandelier and we will line the bridal aisle with glass votives. 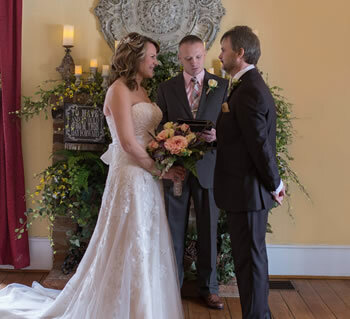 Our wedding planner and owner, Nichol, will be on hand to make sure your event is magical. We will be happy to arrange the ceremony by either the local justice of peace or minister. After the ceremony, there will be a hearty display of heavy hors d’oeuvres for your guests including signature dishes like our Cooper’s Landing Hot Crab Dip, Sausage Stuffed Mushrooms, Baked Brie topped with a Kahlua Pecan Compote, Stuffed Tomatoes with Goat’s Cheese and Fresh Herbs, Chicken Salad Croissants, and Barbecue Meatballs. There will also be three chilled bottles of champagne for the wedding toast and for your guests. Our pastry chef will customize a two-tier white wedding cake to meet your sweet-tooth desires. There will be long stem roses or wildflowers for the bride which can either be arranged into a bridal bouquet of arranged in your room. In addition to a dream wedding, your package will include TWO nights in one of our most romantic rooms with a queen / king bed, fireplace, soaking clawfoot tub or double Jacuzzi tub. On one of the nights you stay with us, join us downstairs in one of our candlelight dining rooms or have a fireside dinner in your room from our award-winning restaurant, Traveler’s Tavern. After dinner, dip into “Cooper’s Springs,” our enclosed hot tub in the restored smokehouse which boasts a hanging chandelier and skylight to view the night stars. Once you return to your room there will be silk rose petals on the bed and a tray of chocolate covered strawberries. Enjoy all the romance for $1545 for a deluxe room, $1645 for a double Jacuzzi suite, $1845 for a private two-bedroom cottage. ($100 of the total package is payable directly to the minister for your ceremony fees) Package suitable for 13-25 wedding guests. 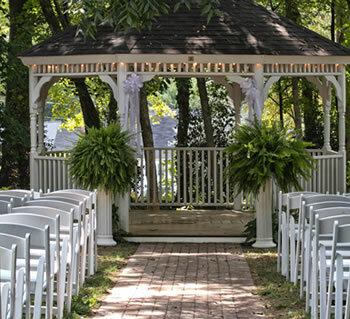 Your ceremony will be held in our Secret Garden Wedding Gazebo. 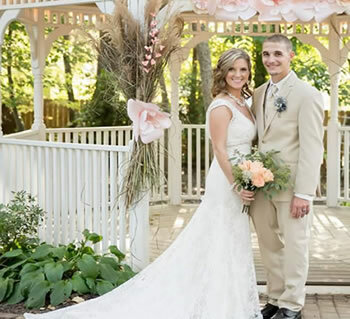 The white wedding gazebo is surrounded by 16 foot Wayland Cypress trees to make the bride and her guests feel like they have escaped to a secret garden. The gazebo makes the perfect location for a day or night wedding. If you’d like to hold your wedding under the stars, the gazebo is lit by a hanging chandelier and we will line the bridal aisle with glass votives. 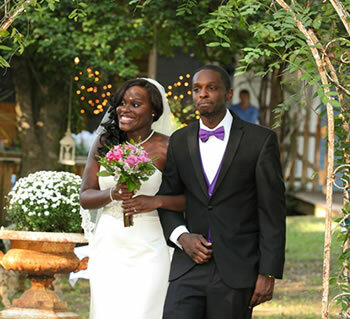 Our wedding planner and owner, Nichol, will be on hand to make sure your event is magical. We will be happy to arrange the ceremony by either the local justice of peace or minister. After the ceremony, there will be a hearty display of heavy hors d’oeuvres for your guests including signature dishes like our Cooper’s Landing Hot Crab Dip, Sausage Stuffed Mushrooms, Baked Brie topped with a Kahlua Pecan Compote, Stuffed Tomatoes with Goat’s Cheese and Fresh Herbs, Chicken Salad Croissants, Barbecue Meatballs, Cheese Platter, Fruit Platter, Mini Quiches, and Mini Desserts. There will also be six chilled bottles of champagne for the wedding toast and for your guests. Our pastry chef will customize a two-tier white wedding cake to meet your sweet-tooth desires. There will be long stem roses for the bride which can either be arranged into a bridal bouquet or arranged in your room. If you’d prefer different colored roses or a mixed flower bouquet, just let us know when booking your reservation and we’ll accommodate your request. There will also be a boutonniere for the groom to match your bouquet. This package includes rental and set-up of white chairs at the Gazebo site. In addition to a dream wedding, your package will include TWO nights in one of our most romantic rooms with a queen/king bed, fireplace, soaking clawfoot tub or double Jacuzzi tub. On one of the nights you stay join us downstairs in one of our candlelight dining rooms or have a fireside dinner in your room from our award-winning restaurant Traveler’s Tavern. After dinner, dip into “Cooper’s Springs,” our enclosed hot tub in the restored smokehouse which boasts a hanging chandelier and skylight to view the night stars. Once you return to your room there will be silk rose petals on the bed and a tray of chocolate covered strawberries. Enjoy all the romance for $2475 for a deluxe room, $2575 for a double Jacuzzi suite, $2775 for a private two-bedroom cottage. ($100 of the total package is payable directly to the minister for your ceremony fees) Package suitable for 26-50 wedding guests. Your ceremony will be held in our Secret Garden Wedding Gazebo. The white wedding gazebo is surrounded by 16 foot Wayland Cypress trees to make the bride and her guests feel like they have escaped to a secret garden. The gazebo makes the perfect location for a day or night wedding. If you’d like to hold your wedding under the stars, the gazebo is lit by a hanging chandelier and we will line the bridal aisle with glass votives. 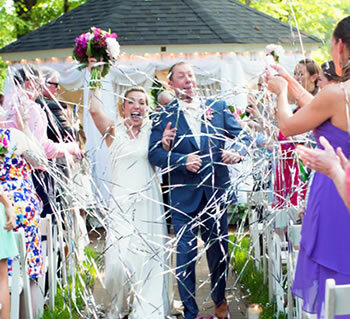 Our wedding planner and owner, Nichol, will be on hand to make sure your event is magical. We will be happy to arrange the ceremony by a local minister or justice of peace. After the ceremony, there will be a hearty display of heavy hors d’oeuvres for your guests including signature dishes like our Cooper’s Landing Hot Crab Dip, Sausage Stuffed Mushrooms, Baked Brie topped with a Kahlua Pecan Compote, Stuffed Tomatoes with Goat’s Cheese and Fresh Herbs, Chicken Salad Croissants, Barbecue Meatballs, Cheese Platter, Fruit Platter, Mini Quiches, and Mini Desserts. There will also be twelve chilled bottles of champagne for the wedding toast and for your guests. Our pastry chef will customize a three-tier white wedding cake to meet your sweet-tooth desires. The top tier will be boxed for you to enjoy on your one-year anniversary. There will be long stem roses or wildflowers for the bride which can either be arranged into a bridal bouquet or arranged in your room. If you’d prefer different colored roses or a mixed flower bouquet, just let us know when booking your reservation and we’ll accommodate your request. There will also be a boutonniere for the groom to match your bouquet. In addition to a dream wedding, your package will include TWO nights in one of our most romantic rooms with a queen / king bed, fireplace, soaking clawfoot tub or double Jacuzzi tub. In your room upon arrival, there will be a fresh fruit and cheese platter, bottle of red or white wine, and two commemorative Cooper’s Landing wine glasses for you to keep to remind you of your magical wedding. On one of the nights you stay, join us downstairs in one of our candlelight dining rooms or have a fireside dinner in your room from our award-winning restaurant Traveler’s Tavern. After dinner, dip into “Cooper’s Springs,” our enclosed hot tub in the restored smokehouse which boasts a hanging chandelier and skylight to view the night stars. Once you return to your room there will be silk rose petals on the bed and a tray of chocolate covered strawberries. Enjoy all the romance for $3495 for a deluxe room, $3595 for a double Jacuzzi suite, $3795 for a private two-bedroom cottage. ($100 of the total package is payable directly to the minister for your ceremony fees) Package suitable for 51- 75 wedding guests. Your ceremony will be held in our Secret Garden Wedding Gazebo. The white wedding gazebo is surrounded by 16 foot Wayland Cypress trees to make the bride and her guests feel like they have escaped to a secret garden. The gazebo makes the perfect location for a day or night wedding. If you’d like to hold your wedding under the stars, the gazebo is lit by a hanging chandelier and we will line the bridal aisle with glass votives. 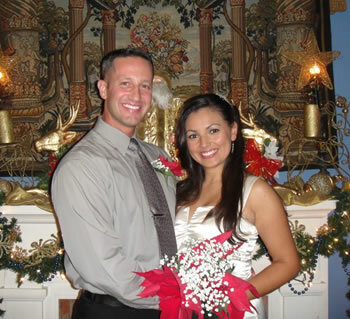 Our wedding planner and owner, Nichol, will be on hand to make sure your event is magical. We will be happy to arrange the ceremony by a local minister or justice of peace. After the ceremony, there will be a hearty display of heavy hors d’oeuvres for your guests including signature dishes like our Cooper’s Landing Hot Crab Dip, Sausage Stuffed Mushrooms, Baked Brie topped with a Kahlua Pecan Compote, Stuffed Tomatoes with Goat’s Cheese and Fresh Herbs, Chicken Salad Croissants, Barbecue Meatballs, Cheese Platter, Fruit Platter, Mini Quiches, and Mini Desserts. There will also be fifteen chilled bottles of champagne for the wedding toast and for your guests. Our pastry chef will customize a four-tier white wedding cake to meet your sweet tooth desires. The top tier will be boxed for you to enjoy on your one-year anniversary. There will be long stem roses or wildflowers for the bride which can either be arranged into a bridal bouquet or arranged in your room. If you’d prefer different colored roses or a mixed flower bouquet, just let us know when booking your reservation and we’ll accommodate your request. There will also be a boutonniere for the groom to match your bouquet. This package includes rental and set-up of white chairs at the Gazebo site. In addition to a dream wedding, your package will include TWO nights in one of our most romantic rooms with a queen / king bed, fireplace, soaking clawfoot tub or double Jacuzzi tub. In your room upon arrival, there will be a fresh fruit and cheese platter, bottle of red or white wine, and two commemorative Cooper’s Landing wine glasses for you to keep to remind you of your magical wedding. On one of the nights of your stay with us, join us downstairs in one of our candlelight dining rooms or have a fireside dinner in your room from our award-winning restaurant Traveler’s Tavern. Your romantic dinner can also be served the night before your wedding if you so desire. After dinner, dip into “Cooper’s Springs,” our enclosed hot tub in the restored smokehouse which boasts a hanging chandelier and skylight to view the night stars. Once you return to your room there will be silk rose petals on the bed and a tray of chocolate covered strawberries. Enjoy all the romance for $4475 for a deluxe room, $4575 for a double Jacuzzi suite, or $4775 for a private two-bedroom cottage. ($100 of the total package is payable directly to the minister for your ceremony fees) Package suitable for 75-100 wedding guests. The Wedding Gazebo area is suitable for both wedding ceremonies and receptions for up to 150 people. For wedding events over 100 people, please call directly and we will be happy to help customize your event. If your event is over 150 guests please visit our link for weddings at our sister property Turtle Cove. 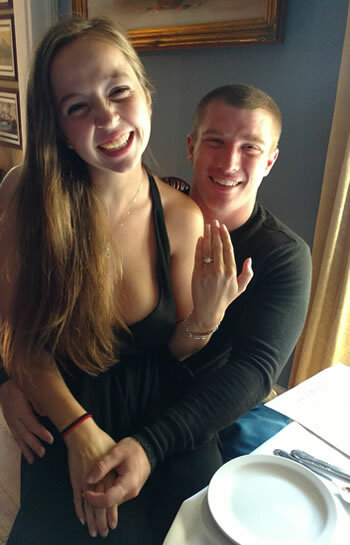 Whether the two of you are eloping to Cooper’s Landing or holding an elaborate affair with 400 guests, Chef Les will create a personalized wedding cake that celebrates your personality. From edible orchids, to rich buttercream frosting, to Strawberry and Chambord filling, your cake will please the palate! The Wedding Gazebo area is suitable for both wedding ceremonies and receptions for up to 150 people. For wedding events over 100 people, please call directly and we will be happy to help customize your event.